I don't like the look, smell, nor the taste of seafood. I'm not part of the problem. The Asian nations take what they want without regard to seasons and recovery cycles. So they fish out the waters and even local fishermen have to buy bigger boats so they can travel hundreds of miles for the daily catch. Take yellow fin tuna that Japan has over fished for decades. They don't care, the shortage just drives up prices. I was told on a fishing trip in the Gulf of Mexico that if anyone of us caught a yellow fin we were to quickly take it into the port and sell it for huge profits. A medium sided tuna could bring $30,000 and they Fedex'd it right away to Japan. 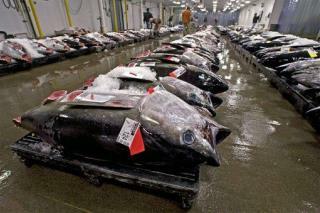 Blue fin tunas can sell for millions but we aren't going to catch one in the gulf. That demonstrates how bad things are.